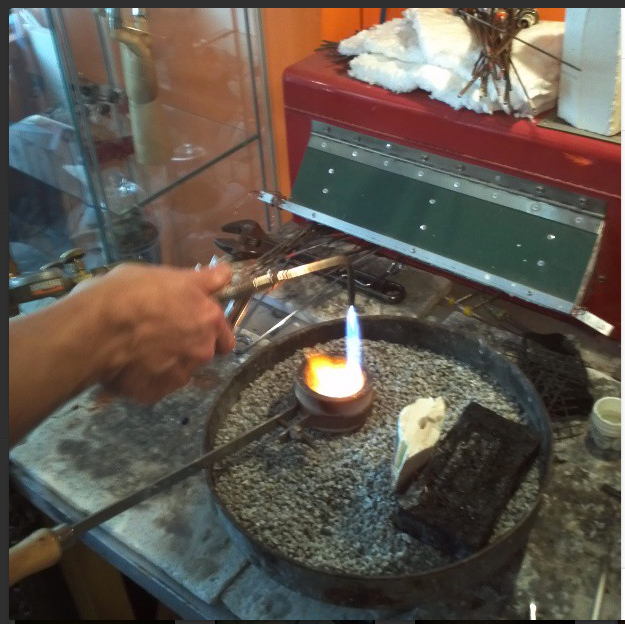 Lost wax casting in our Metal + Glass course! Learn how to form, fabricate, solder, set-stones and more in our 4 wk Metal + Glass course. Metal + Glass courses are offered evenings Monday & Wednesday. Now this 4wk course includes lost wax casting in situ! The entire process included in our $285/pp course. This deal expires January 2018- register soon! Metal 2 is almost full! 1 space left as of March 7th! Demonstrations in fold forming, etching (copper & silver), and hollow forms (making silhouette dies), electroplating, Lost Wax casting and fusing glass small scale items & Sterling settings. This course gives students hands on experience manipulating metal, electroforming, and embellishing metal, while sharpening soldering and fabrication skills working on personal projects. Students will work together and independently on their projects. Starting out with an introduction on techniques covered, expectations, design considerations, and ends with students finishing off fold formed samples/pieces, an etched hollow form, electroforming organic/inorganic objects, setting up & casting for lost wax, fusing a small glass colour bar*, and unusual settings with Sterling silver. Fast paced, students need to show up ready for action! Materials fee includes: a 3″x 3″ piece of 16 gauge Sterling silver plate, 16 gauge 12″x 6″ copper, 2 ounces of Sterling silver casting grain, 1 gross of 3/0, 1/0, & 1 doz spiral saw blades. 3″x4″ plexiglass, Silver solder, flux, wax and expendables necessary for (copper) electroforming, casting and glass for fusing. Use of tools and equipment. Beginners welcome! Register online! nanopod: Hybrid Studio’s -metal + glass- course has started to fill up! Next 8 week course starts up Monday, April 28th. Further info, and how to register can be found here!